Arrow Academy’s July Blu-ray releases are a classic Hollywood romantic drama making it’s hi-def debut, and a magnificent Dostoyevsky adaptation, both with lavishly illustrated collector’s booklets, video appreciations and rare radio plays, along with much, much more. First in July is Hold Back the Dawn (1941), a heart-rending romantic drama, from one of the most underrated directors of Hollywood’s golden era, Mitchell Leisen, starring Charles Boyer, Pauline Goddard and Olivia de Havilland. A moving and thoughtful film with a wonderful script co-written by Billy Wilder, it was nominated for no-less than six Academy Awards. 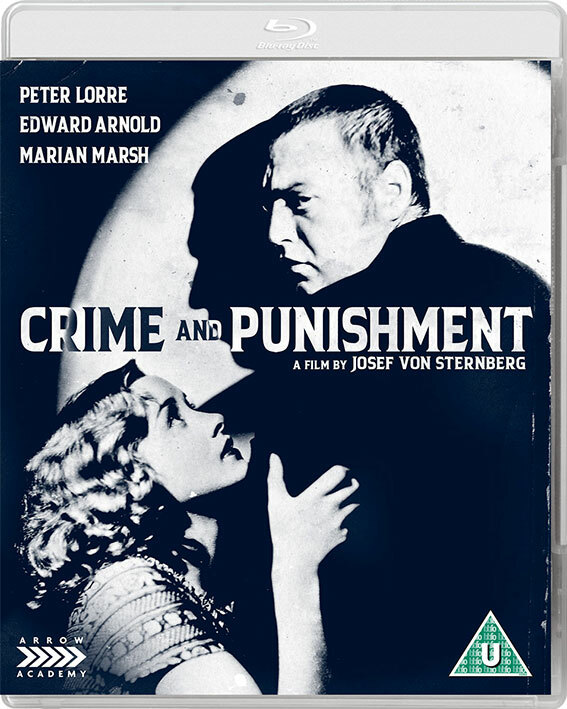 June also sees the release of Crime and Punishment (1935), a star vehicle for the incredible Peter Lorre (The Maltese Falcon), playing the guilt-wracked Raskolnikov in a big-screen adaptation of Fyodor Dostoyevsky’s most famous novel, helmed by Josef von Sternberg (famed for his collaborations with Marlene Dietrich). Stylish direction and Lorre’s tour-de-force performance are ready for rediscovery in this Blu-Ray premiere, that includes a documentary on Lorre, and comes with handsome reversible sleeve art. Charles Boyer (Gaslight) gives an enthralling performance as Georges Iscovescu, a Romanian-born gigolo who arrives at a Mexican border town seeking entry to the US. Faced with a waiting period of eight years, George is encouraged by his former dancing partner Anita (Pauline Goddard – Modern Times) to marry an American girl and desert her once safely across the border. He successfully targets visiting school teacher Emmy Brown (Olivia de Havilland – Gone with the Wind), but his plan is compromised by a pursuing immigration officer, and blossoming feelings of genuine love for Emmy. A moving and thoughtful film with a wonderful script (co-written by Billy Wilder), Hold back the Dawn benefits from evocative performances by Boyer and de Havilland, and an over-arching sense of romantic melancholy. An enduring classic of its era, Leisen’s film was nominated for no-less than six Academy Awards and is presented here in High Definition for the first time. After fleeing Nazi Germany following the success of M and re-establishing himself in Britain as a villain for Alfred Hitchcock, the great Peter Lorre arrived in Hollywood in 1935, signed to a contract with Columbia Pictures. His dream star vehicle: a big-screen adaptation of Fyodor Dostoyevsky’s most famous novel Crime And Punishment. His choice of director: Josef von Sternberg, already celebrated and castigated in equal measure for his seven-film collaboration with Marlene Dietrich. Roderick Raskolnikov (Lorre) has graduated from university as a noted expert in criminology, but nonetheless lives in extreme poverty. Desperate and anguished, he murders a miserly pawnbroker, stealing her valuables before fleeing into the night. The next day, he encounters Inspector Porfiry (Edward Arnold), the detective assigned to the murder, and is asked by Porfiry to consult on the case when an innocent man is arrested as a suspect. How long until the conflicted, guilt-ridden Raskolnikov arouses the master detective’s suspicions? One of many attempts at the time by Hollywood studios to give cinema an air of prestige by adapting great works of literature, Von Sternberg’s stylish direction and Lorre’s tour-de-force performance are ready for rediscovery in this Blu-Ray premiere of their only collaboration.